I tried disabling ipv6 on my local machines and still no dice. On the Fritzbox I set the DNS entries to Google's public DNS servers (8.8.8.8, 8.8.4.4) since they don't require that requests come from a particular IP address. The Fritzbox still refused to use the Google DNS addresses under all circumstances. In the end I bought a nice router and put a custom firmware on it and I use it to connect to a VPN. It's less than ideal since reconnecting to the VPN is not automated and there is about a 10-second delay when starting videos. Otherwise it works well. 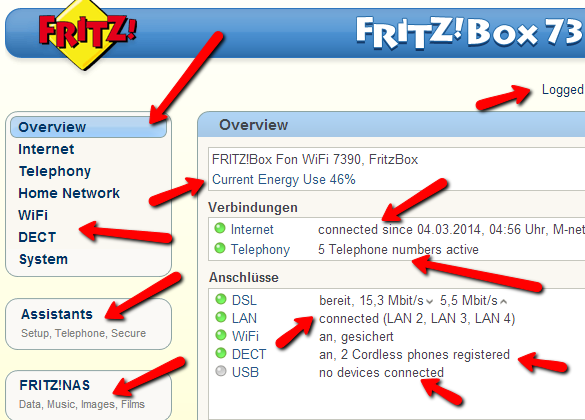 One thing I hadn't considered: can DHCP on the fritzbox be turned off? If so, you could use another machine or even a Raspberry Pi to do DHCP with your own DNS entries. Somewhat related: here's a nice website to test (among other things) what DNS server is truly being used. In the end I bought a nice router and put a custom firmware on it and I use it to connect to a VPN. Indeed, a wise decision *not* to flash the primary router, but a second cheap router. What about writing a little tutorial on how to set up that (unspecified) router with that (unspecified) firmware for other interested TTers? If it is based on OpenVPN: it should be possible to enable an autoconnect/reconnect. Yes, it can be switched off. However, due to my experience I'd rather not recommend to do that. 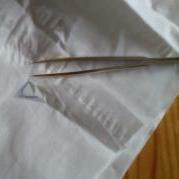 You break other functions of the fritzbox. 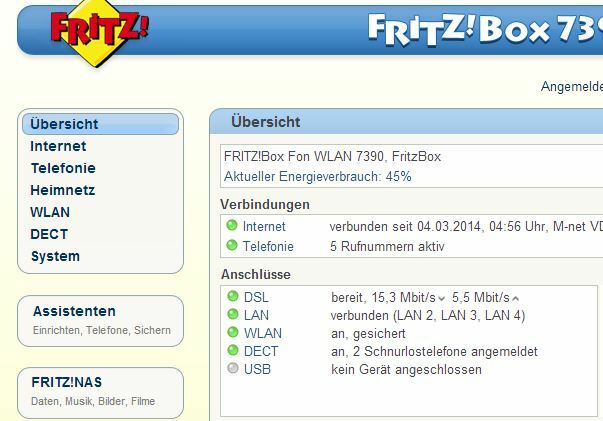 Let the Fritzbox be the DHCP-Server and the DNS-Server for your home. 2.) My own DNS-server (I uses DNSMASQ) is set up on the Raspberry, and my router is set up to forward all DNS-queries to the raspberry. And my provider's DNS is set up as secondary DNS on the Fritz, so when the Raspberry fails, I still have access to the internet. So, anything where money is involved I resolve with my provider's DNS, anything else is resolved by overplay (with one known exception where overplay breaks access), and some annoying pages are not resolved at all. 4.) Some other functions that I've set up on the raspberry: Access to a VPN provider, and that access is spawned onto a WiFI-adapter plugged into the raspberry (Which acts as Wifi-Hotspot "London"): When I want to switch to VPN-access, all I have to do is switch my laptop from using the HotSpot "MyHome" to the HotSpot "London". 4a.) Awake my NAS when the TV is switched on. And as a last note: The IP-addresses of VPN-providers are under constant fire from port scanners by bad asses. Setting up a VPN without proper firewalling is asking for trouble! What stopped me from using a freetz.org image was that [gasp] my router wasn't in the support list. Also, it turns out that I must use an M-Net router, so it stands to reason that the M-Net router effectively ceases to be one without the custom M-Net firmware. I don't have proof that M-Net has custom firmware, but I have a strong suspicion. Regarding the second router...I didn't say cheap. There's already a tutorial here. I don't have proof that M-Net has custom firmware, but I have a strong suspicion. I was thinking of writing a Chrome extension (and Firefox greasemonkey script) that auto-translated the text of the pages. I wrote a translating script for the FritzBox 7390 that works on Chrome and Firefox but I only had time to add about 10 words/phrases to translate. So it keeps those translated whenever you're on the router's homepage. I lost interest in going through each page, gathering up all the words and translating them all. If anyone's interested that would quite happily go through the menus collecting all the words and translating them, volunteer away. Let me know first on here before doing it though, so I can guide on how to present the results. I actually enjoy reading this thread and the one on satellite tv even though I only watch UK tv rarely and then via Filmon. That may change as my daughter is considering doing a praktikum in Germany and she will not be able to live without UK tv on a television. I admit that I understand little or nothing of what I read but it sure seems like an awful lot of faffing about just to watch "foreign" television on an actual television set. Even then it seems people are transmitting the signal to the tv via Ipads, apple tv and airplay so it is in fact not watching tv as I would understand it at all. I am just surprised that with these so called internet TVs that you could not just run film on or something similar on the tv itself. I am actually dreading having to research all this and set something up that resembles watching tv as you would do it in the UK, with just a tv and a remote. my daughter is considering doing a praktikum in Germany and she will not be able to live without UK tv on a television. She'll probably have far less problem watching stuff on her computer/tablet than you would. I have a niece who just went through uni and now works in London and she's barely spent any time sat in front of a TV. It's all about iPlayer and ITVPlayer and 4oD and Demand 5 on her laptop, ipad, and occasionally iPhone. She also has her own Netflix sub. The idea of paying a TV licence and buying a big box that sits in the corner of the room that you can only watch if you're sat in front of it is foreign to her. The "tv" comes to her on her terms when and where she dictates. This is just the way it is for the younger generation. I'm just happy I'm still near the cutting edge in my 40's. The simplest approach is a smart TV - I have a 22" Samsung that cost around 250€ and works perfectly for all UK services. It IS a bit fiddly to setup, but once that's done then it's "just a TV and remote" to operate. Bear in mind that key to all of this is a decent internet connection, ideally 16Mb/s or better, preferably wired to the device receiving TV content rather than wireless. In most cases you also need to do a little network configuration, such as implementing SmartDNS to get around the geographical limitations of most non-German TV sources. Lappy,HDMI cable and filmon.tv That´s how I do it.Picture and sound through the TV. This odd version might have something to do with the patch that was released recently addressing this issue of fritzboxes being used to make calls abroad by the unscrupulous. I remember reading that AVM rolled out their updates but these wouldn't go to M-Net provided boxes as M-Net needed to release their own custom patches. Damn shame my only other option is Telekom with whom I am loathe to do any business after my last experience (money grabbing bastards). It's actually a lot easier than it sounds, and no more faffing around than setting up a TV with a Sat box. We all know how to do that so easily these days, we just take the steps for granted, but when you add everything up (Installing dish on the roof, plugging in TV and separate receiver, tuning, setting favourite channels and preferred order, etc). If you take a sat reciever and hand it over to an even older generation, they would also scratch their head. LOL, it took my Gran 15 years to finally figure out how to rewind a VHS tape, let alone set up a scheduled recording! As for Apple TV and AirPlay. It may sound complicated, but it is actually as good, if not better in many ways than a traditional remote - true couch potato living. Just think of it as the Apple TV is the set-top-box (i.e. Sat box, receiver, VHS box etc) and the iPhone or iPad is the remote. Simple, the final result is exactly as you could expect real, normal television to be. In fact, I even watch live German TV this way even though I also have that going through the satellite - it is just easier. As for these Internet TV's just running FilmOn. Actually, they sort of can. The only reason FilmOn is not on the Internet TVs, is that Alki David hasn't yet developed the app for it. Other companies have. Zattoo for instance is available directly on many Smart TVs and is like FilmOn, only better. The catch is that it seems a bit buggy at the moment on Samsung TVs (don't know about the other models). But all that is talking about trying to replicate the traditional way of watching linear (or live) TV but through the Internet. Forcing Internet TV to go this path is fine, but it really is a bit like trying to drive an aircraft all the way back to London, instead of just flying it. There are better ways to make use of Internet TV. As for all the research. Don't go through so much trouble. Just ask here, or visit my website Eye on Demand where I do my best to answer all these questions as I had to go through it all myself. It really is a lot easier than you may think, you just have to think differently to what you may have done so in the past. Thanks for the feedback everyone. My daughter is a bit old fashioned; it would appear as watching normal UK TV on a television is top of the wish list if she comes here. She certainly does all the other stuff Derek mentions but the dearth of programming here in English, even with a Kabel sub, were not to her liking the times that she visited and she said that when she comes she would really prefer normal television on the TV. The first option YL6 mentions should be doable: I have Kabel at 100mb/s although it is more like 50mb/s wireless, the switch from MNet to Kabel nearly drove me up the wall, but now it is all working and supporting two pcs, Ipad, two sony phones, a blackberry, iphone, Macbook Air and a Kindle thingy. It looks as if I will need a new TV though as the existing one only has one HDMI slot and I have been looking at the thread on the best TV for Expats. It is the Smart DNS or a VPN that has me worried though as I am completely illiterate as far as routers are concerned. The logistics have me a bit concerned as well as the cable modem is in the basement but the WiFi router is on the first floor in my office. I can just see me trying to set this up causing mayhem with everything else that has been configured here. Anyway, if Katie decides to come here I will just have to bite the bullet, and see how it pans out. Epic win on that typo. Yes, that is an excellent solution YL6 suggests. It provides all the main UK catch-up services, and works very well and is very much a TV, remote and sofa. For this to work, it must be a Samsung TV, and the F-series is far better than the E-series. The reason it must be Samsung, is that is the only one that 1) can be switched to UK apps (and not affect normal German TV) and 2) Has all the UK catch-up services. Note: You do have to perform a small change to the TV in the settings to set it to the UK app store which is not in the manual. But we can help you with that. Secondly, you do realize this is not live UK TV still? It is catch-up. It is the Smart DNS or a VPN that has me worried though as I am completely illiterate as far as routers are concerned. What you want is Smart DNS (VPN is not so good for the TVs) and if you are just setting up the TV, you don't need to touch the router for the Samsung Smart TV. The configuration can be done direct inside the TV's basic network settings and is very easy, we can help you through it though if you have problems. The logistics have me a bit concerned as well as the cable modem is in the basement but the WiFi router is on the first floor in my office. I can just see me trying to set this up causing mayhem with everything else that has been configured here. It is always best to have an Ethernet cable for streaming video, but if your WiFi is strong enough where the TV plans to be, it should be ok. I would test Smart DNS before buying a new TV though! It could be that your ISP is a bit like MNet which has problems with Smart DNS. Probably not, but it won't cost you anything to test it, as if it doesn't work, you can usually get a refund if you cancel in time. If you don't have convenient cable based internet connection near the TV you can create one using a "powerline" adapter which conveys internet over your house power cables (example) - they cost upwards of about 30€ a set depending on quality and speed and are easy to use - you plug one in near the router and connect it to an internet port and the other near the TV and connect it to the TV. My wifi in the kitchen is quite weak, and is destroyed when running the microwave, so this was a simple solution to getting the TV running there and is easy to set up. Significantly BBC management appear to be focussing on iPlayer as the way ahead, having invested tremendous amounts of money to bring a quality and refined TVoIP product to many different platforms. They see it as a media to target new (especially young) audiences, as well as a vehicle to provide flexible on-demand viewing content. At the moment iPlayer only reaches 25% of the UK population, but it is a stated goal to achieve a 75% reach and be a primary method of accessing BBC content rather than third choice as it is now (after broadcast and off-line media such as DVD). It's actually a lot easier than it sounds, and no more faffing around than setting up a TV with a Sat box. Question if I may - I am just about to set up a home cinema room with a 55" TV and a Teufel Impaq 7000 system.